I would like to start off my blog with a place that is very close to my heart – SEATTLE. And the hotel that I will always remember dearly. We went to Seattle in 2010 and I recall that people asked me – Why Seattle? To which I answered – Why not? We became interested in Seattle after watching ‘Grey’s Anatomy’. I remember Seattle as having dreary, rainy skies all day on the show and I love it. Unlike most people who love the sun, I love the rain. I love the way the air smells after a heavy rainstorm. After discussing our travel options, as usual, I embarked on a mission to research as much as I can. I bought guidebooks like Frommer’s, Lonely Planet (I like to buy so that I can write and circle places on the book), borrow older editions from the library ( what if the new editions missed out some crucial restaurant review or juicy tip??!) and also googled Seattle to death. After all the research on hotels, I decided on the #1 hotel there – Inn at the Market. Before we went, I did not know what it meant when the website mentioned that it is the only hotel IN the Pike Place Market. Can a hotel be IN the market? I had doubts but as it was definitely near Pike Place Market, I hoped it would be worth it. Everything that I wanted from a hotel – cosy, accessible, near great restaurants, soft luxurious bed and staff that are helpful and knowledgeable about the area. 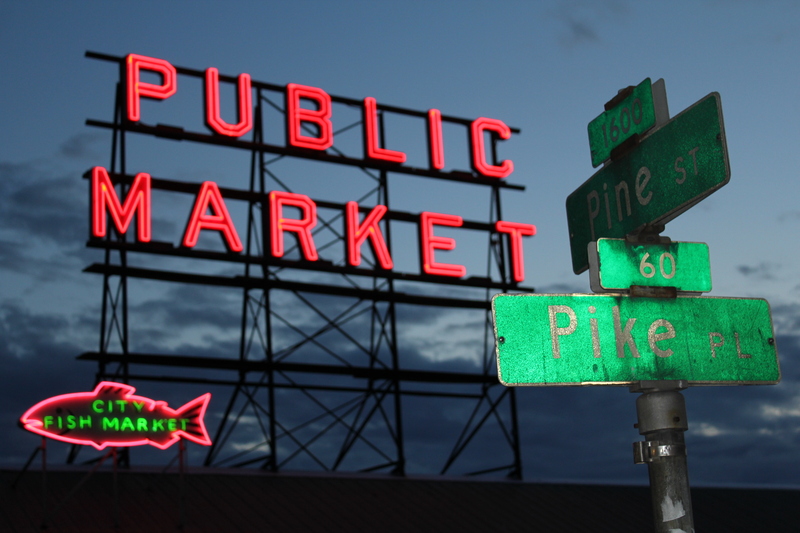 It is downtown, just at Pike Place Market, facing Puget Sound, near acclaimed restaurants (I will come to that in the other post) and has a great vibe to it. Every morning, we wake up to the sounds and sights of Pike Place Market and see the farmers unloading their daily wares, fruits, vegetables, flowers, fish … the feeling could not get better. I will always remember Inn at the Market fondly. Seattle is such a gorgeous city. I forgot Grey’s Anatomy was set there. Did you have the opportunity to visit the North Seattle Mall? HI Cary, no we didnt. We went to Nordstom though and bought tons of stuff back to SG. I just came back from being a tourist in Seattle, and some of the places you wrote about are where I didn’t go to! And seems like I missed out heavy dosages of fun! Though yea my visit to Seattle was still fun. Many antique stuff there. Looks like I found my next holiday destination! I love the rain and Greys Anatomy too! Great!! Thank you for reading! It’s always interesting for me to read the impressions of my home town by visitors. You may be the first person I recall saying they prefer rainy days. Funny that Grey’s Anatomy played a role in your decision. Seattle was growing up as I was. I watched the daily progress when the Space Needle was being built. I attended the University of Washington, and I still root for my Huskies. I enjoyed your writing. Nice post! Thank you for reading! Yes, I love Seattle and the rain! Nice to meet a Seattleite!